With an area of 25.713km², Republic of Macedonia is a country located in the heart of the Balkan Peninsula, in Southeast Europe. This mountainous and landlocked country called “the small Switzerland” is bordered with Serbia to the north, Greece to the south, Bulgaria to the east, Albania to the west and Kosovo to the northwest. 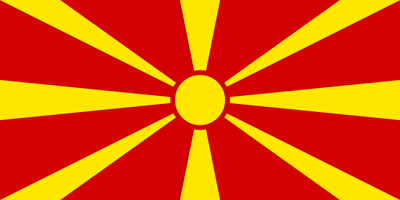 Republic of Macedonia is its constitutional name and it was one of the successor states of the former Yugoslavia from which it declared its independence through a referendum on 8th of September 1991. Republic of Macedonia is a member of the United Nations since 1993 and it has been a candidate for joining the European Union since 2005. The country has also applied for NATO membership. It counts around 2.000.000 inhabitants and the majority, or approximately 65% are Orthodox Christians. The second practiced religion is the Islam and among the Muslims, most numerous is the Albanian minority. The official language of the country is Macedonian language, which makes a part of the Slavic group of languages. In municipalities where ethnic groups are represented with over 20% of the total population, the language of the ethnic group is used, alongside Macedonian. The capital of the country and the largest city is the city of Skopje, the political, educational, cultural and administrative center. The official currency is DENAR and 1euro is equal to 61.3 denars. Being a biblical country, cradle of the orthodoxy and the Cyrillic alphabet, connected to the great name of Phillip and Alexander the Great, occupied by many different civilizations, Macedonia possesses rich history and exceptional natural beauty with breathtaking landscapes. It is a country of excellent wine and delicious traditional specialties prepared from the hands of the welcoming and friendly people. It is a small country where each region is special and different in many levels. It is a real mosaic of cultures where you can reveal the story of one impressive civilization that will leave you speechless and with great desire to visit the country again.